Mommy was apparently very eager to get to the hospital this morning. It was a hard 1st night without her. I got pulled over for speeding on the way there & completely lost it. I'm sure the officer thought I was a basket case. There is no way he understood what I was saying. He told me that driving upset was worse than driving drunk so I pulled over to a gas station and got myself together. He let me go on a warning. The 1st time I had ever got a warning & I am thankful! 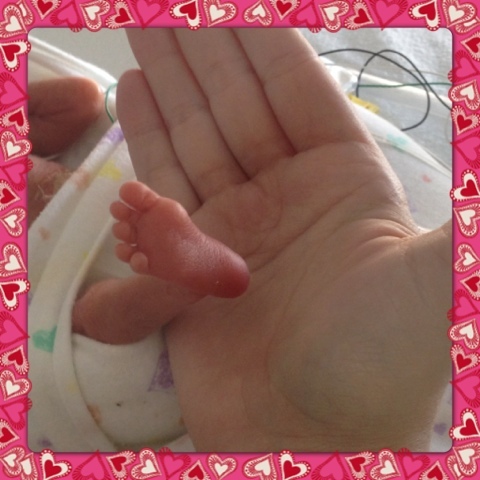 Briella has done so good with her feedings that they've doubled the amount to 2ml every 3 hours!!! She had her first two dirty diapers today which is great news. It means things are working properly. I never dreamed I'd be so thankful and excited over poop! 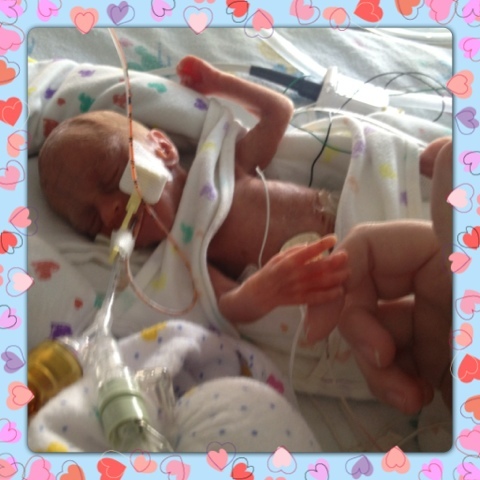 She has gained 10 more grams and is up to 620, which is about 1lb 6oz I believe. I cannot wait to see what she weighs in a week! No huge changes in her care today. She is going to have a PIC line put in tonight or tomorrow. A little scary but I have faith that her nurses are knowledgeable & will do it correctly. Of course they have to tell me all the things that can go wrong. Also tomorrow she will be having her 1st head sonogram. It is common that babies her age experience a brain bleed. I am pretty nervous about this. I pray that she passes this test. Daddy again missed out on seeing his princess. We need him to feel better quick because Brie is missing him! This little girl is trying so hard to open her eyes! I told her she can't do it when Mommy's not there! I am so excited to see what she looks like! Please pray that we get good news tomorrow from the sonogram and that Briella is not in pain from the pic line procedure and that everything goes well. I am from What-to-expect, Jan 2013 group and have been following your Blog for a wk and half! Congratulations on Brielle and want u to know You and Your Family have been in my deepest thoughts and upmost Prayers! I pray your DH Brian will get well soon and can be there with you and Brielle soon! Also Pray for Brielle and her days ahead to continue to stay Blessed! Been checking in every evening for an update on baby Briella, glad to hear she is doing so well. It sounds like she has amazing nurses & she's going to do well with the pic line. Good luck tomorrow with the sonogram! I'm from the WTE January 2013 forum and I've been following your blog for a few weeks now. I can't tell you how amazing it is to read your story & know that baby Briella (and you) are doing well! I will keep you and your family in my thoughts and prayers! What a great miracle this baby is! God is good! !